Between all the construction activity and almost nonstop flight simulations, United Airlines’ Flight Training Center in Denver is a particularly busy place these days. Denver beat out Houston and Chicago to win the consolidated flight training center last year. By the time the consolidation is complete at the end of 2017, United will have nearly doubled the number of flight simulators it has in Denver to 32 — including modules for the new Boeing 787 Dreamliner and Airbus A350 — without adding a single square foot to its building footprint. “Everyone is thrilled we’re going to be in one hub, ” senior project manager Graham Smith said during a construction tour this week. That construction is moving forward at full bore, balancing the needs of the top-to-bottom renovation with the airline’s ongoing training demands. 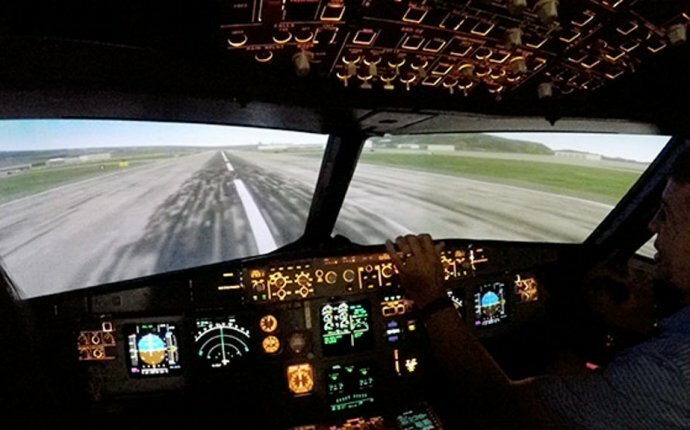 Flight simulators operate 20 hours a day — idle only from 2 to 6 a.m. for maintenance. On a recent morning, pilots climbed into the cockpit of a Boeing simulator while other modules nearby sat in various stages of reassembly, waiting for their outer coverings and hydraulics to be reattached. In another bay, construction workers cut into the thick concrete floors so they could reinforce the pads that will support brand-new simulators coming from Canada, working equally hard to keep the dust away from the sensitive equipment already in place next door. The first of eight flight simulators coming up from the closing Houston training center arrived in July. Each unit must be carefully disassembled, the pieces loaded onto wide-load trucks and driven to Denver, before being reassembled and recalibrated in its new home. Each simulator must also be inspected by the FAA before it can be used for training again. The whole moving process takes three to four months per unit, flight training managing director Michael McCasky said. Another seven simulators are on order from Quebec-based CAE, and by August of next year, all pilot training will have transitioned to Denver. With more than 12, 000 pilots coming through Denver each year, that translates into roughly 69, 000 travel nights a year, said Turid Nagel-Casebolt, director of business development for the city’s Office of Economic Development. All told, including its operations at Denver International Airport, United is the No. 1 nonretail private employer in Denver. To prevent that from happening, the city and state combined forces to provide United a $13.2 million tax-incentive package in exchange for the airline keeping 400 jobs in Denver and adding at least 200 more. Keeping the training center here also solidifies United’s ties to DIA, said Tom Clark, CEO of the Metro Denver Economic Development Corporation, which named the United Flight Training Center its Economic Development Deal of the Year. From United’s perspective, DIA is “one of our best performing hubs, economically and operationally, ” McCasky said. At the time of the consolidation announcement last year, United officials said renovating the Denver training center — as opposed to building a new facility in Houston or Chicago — would also save the airline more than $80 million in upfront capital expenses. The airline began training pilots at the Stapleton campus in 1968. “It has great bones, ” McCasky said. United hasn’t ruled out future expansion in Denver, either, McCasky said. The airline is doing analysis now on adding a new building to house even more simulators. In addition to all pilots, mechanics and flight attendants also receive training at the center. Initial pilot training lasts about 30 days, while recurrent training is two to three days, McCasky said. Typically, pilots will fly into Denver from their home base in the morning and convene at the training center in the early afternoon for their first two-hour briefing and four-hour session in the simulator. The next day, pilots get an early start, squeezing in another briefing and four hours in the simulator all before 2:30 p.m., when they’re on the shuttle back to the airport for a late afternoon flight home, McCasky said.